This page describes basics of schmitt trigger. 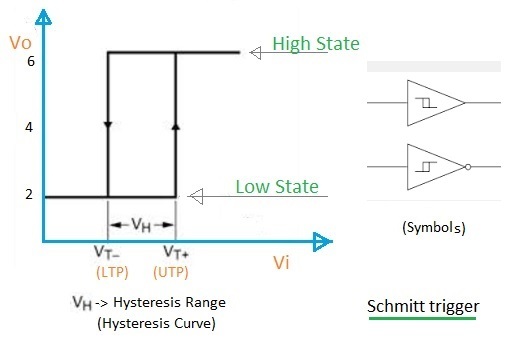 It compares UTP and LTP points of Schmitt trigger and mentions equations for UTP and LTP in Schmitt trigger hysteresis curve. It mentions popular schmitt trigger ICs 74LS132 and 4093B along with applications. The figure-1 depicts schmitt trigger circuit. The Schmitt trigger is basically a bi-stable multivibrator in which feedback is via a common resistor between emitter circuits of two cascaded transistors. Typically in bi-stable circuit, resistor is connected between collector terminal of one transistor with the base terminal of the other. The circuit works in two of the states as per Vi input voltage. ➨ If the input voltage Vi is zero, Tr1 transistor is OFF and Tr2 transistor is in saturation mode. Here Ve is 2 Volt same as Tr2 collector. Here Vo=2 Volt and will remain 2V till Vi is less than 2V. This state is referred as "Low State". ➨If Vi is increased above 2V, Tr1 becomes forward biased and it will conduct; While Tr2 will be cutoff. At this state, Vo is 6Volt. There is no voltage across R4 as current through this is zero. This state is referred as "High State" and it will remain at this state even if Vi is increased further. ➨To bring the circuit to "Low State" again, reduce the Vi. This brings Tr1 into saturation mode and Tr2 into cutoff mode. From the above operation, hysteresis curve as shown in the figure-2 is obtained. The figure-2 depicts hysteresis curve. ➨The value of Vi triggers the schmitt trigger circuit and Vo will jump from "LOW" to "HIGH" state. It is called UTP or Upper Trip Point. ➨While value of Vi which causes jump from "HIGH" to "LOW" state is referred as LTP or Lower Trip Point. In the figure, UTP is about 2V and LTP is about 1V. The figure-3 depicts pin outs of schmitt trigger ICs (TTL 74LS132, CMOS 4093B). Both the ICs are Quad two input NAND Gates. Following are the applications of Schmitt Trigger. In all the applications both the inputs of schmitt trigger IC are joined together. Here gate functions as inverter. 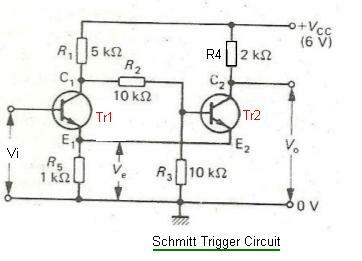 • Rise Time Improver: This schmitt trigger application is shown in figure-4a. As shown it converts slowly changing input into the output having fast rise time. It will also convert sine wave into square wave. • Noise Remover: This application is shown in figure-4b. As shown it removes unwanted high frequency spikes present on the input signal. 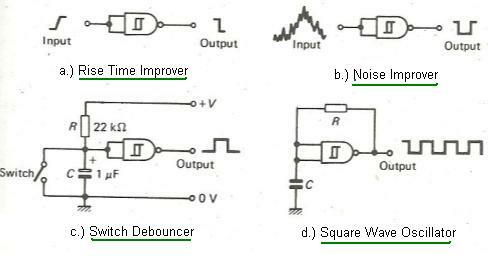 • Switch Debouncer: This schmitt trigger application is shown in figure-4c. This circuit prevents contact bounce at the switch due to discharging function of the capacitor C.
• Square Wave Oscillator: This application is shown in the figure-4d.